. . . the Lord God called to the man, “Where are you?” (Genesis 3:9 NIV). The LORD appeared to Abram and said . . . (Genesis 12:7 NIV). God said to Moses – “I will be with you” (Exodus 3:12 NIV). He said concerning the people of Israel – “. . . I will dwell among the Israelites and be their God. “ (Exodus 29:45 NIV). He said to Joshua, “As I was with Moses, so I will be with you; I will never leave you nor forsake you.” (Joshua 1:5 NIV). He offered to be with Jeroboam as He had been with David, if only he would obey Him (1 Kings 11:38). Through Isaiah God promised His Son (the Messiah) would be “God with us” (Isaiah 7:14; Matthew 1:23). The Apostle John said of Jesus – The Word became a human and lived among us. We saw his glory — the glory that belongs to the only Son of the Father — and he was full of grace and truth. (John 1:14-15 NCV). Jesus promised the abiding presence of the Father, Son and Holy Spirit in those who believe, love and obey Him (John 14:17,23). He promised the dying thief on the cross – “. . . today you will be with me in paradise” (Luke 23:43). And He has promised to return and take all believers bodily to be with Him in heaven (John 14:3). When we consider the awesomeness of God, who and what He is, and who and what we are – we are compelled to say with King David: “. . . what are people that you should think about them, mere mortals that you should care for them?” (Psalm 8:4 NLT). Many know the words but fewer the experience of “Thou art with me.” How about you? Companionship takes two. Now you know what God wants. He’s only waiting to be invited in: “Look at me. I stand at the door. I knock. 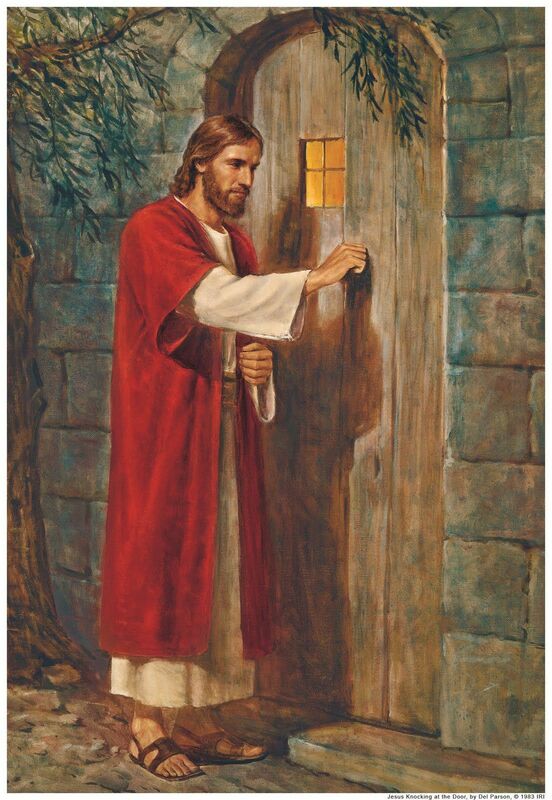 If you hear me call and open the door, I’ll come right in and sit down to supper with you.” (Revelation 3:20 The Message). It was Tuesday afternoon before the Friday of His crucifixion. Jesus and His disciples were leaving the Jerusalem temple when some began to remark about its huge stones and magnificent buildings. Jesus said to them, “Do you see all these great buildings?” . . . “Not one stone here will be left on another; every one will be thrown down.” (Mark 13:2 NIV). 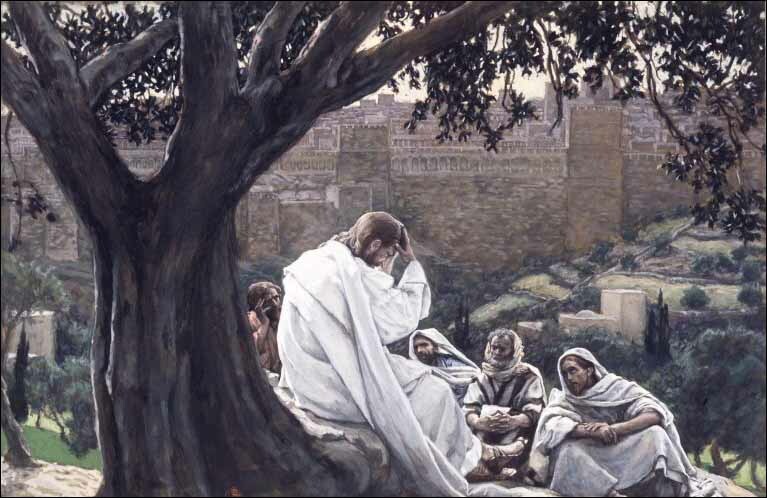 Later, while sitting on the mount of Olives opposite the temple, they asked Jesus when this catastrophe would happen and what sign would precede it (v.4). His answer – “Watch out that no one deceives you!” (v.5). Jesus’ first warned that there will be those who try to use the expectation of His second coming to lure His disciples away from Him to follow them (false Christs) (v.6). Second He warned them not to become anxious about current events, i.e. wars, rumors of wars, earthquakes, famines and the like (verses 7-8). Next, He gave them notice that His disciples would suffer the world’s abuse because of Him, but they would be saved in the end (verses 9-13). Jesus was describing the intervening years between His departure (Acts 1:10 -11) and His return (Revelation 1:7). He then said, “When you see ‘the abomination that causes desolation’ standing where it does not belong — let the reader understand” (Mark 13:14 NIV). In other words, “Here is a definite sign that the temple’s destruction is imminent.” The abomination references an idol image set up in the temple which would desolate or desecrate it and require its abandonment. Such a defilement had been prophesied by Daniel in 11:31-32 and occurred during the reign of Syrian ruler Anitochus Epiphanes in 167 B.C. The temple of Jesus’ day was again violated and utterly destroyed by Roman General Titus in A.D. 70. Those who visit Jerusalem today will not find one stone of that once great edifice left standing upon another – just as Jesus said. Daniel also foretold another temple desecration still future (Daniel 9:25-27). And both Apostles Paul and John prophesied it will be perpetrated by Antichrist just prior to Jesus’ second coming (2 Thessalonians 2:3-4,8-9; Revelation 13:1-10,14-15). Jesus’ point in this prophetic discourse recorded in Matthew 24, Mark 13 and Luke 21 was to encourage His disciples then and in every generation to anticipate and watch for His return. We cannot know the day or the hour (Mark 13:32), but we can and should recognize the signs of the season: “Even so, when you see these things happening, you know that it is near, right at the door.” (v.29). In early March in Georgia, it is easy to recognize the signs of approaching spring. Come late October, you know autumn is very near. Jesus has given us very definite indicators that His return is imminent. Are you watching? Don’t fall asleep! As Paul instructed the Roman believers – Wake up, for our salvation is nearer now than when we first believed. The night is almost gone; the day of salvation will soon be here. (Romans 13:11-12 NLT). Hallelujah! Only days before He was taken and crucified by His enemies, Jesus answered a lawyer’s question concerning the greatest commandment: “The most important one,” answered Jesus, “is this: ‘Hear, O Israel, the Lord our God, the Lord is one. Love the Lord your God with all your heart and with all your soul and with all your mind and with all your strength.’ The second is this: ‘Love your neighbor as yourself.’ There is no commandment greater than these.” (Mark 12:29-31 NIV). The lawyer gave Jesus a verbal A plus for His answer to which Jesus replied: “You are not far from the kingdom of God.” (Mark 12:34 NIV). From then on, no one asked Jesus any more questions. Throughout His ministry on earth, Jesus was asked many questions. Seekers and followers asked Him questions wanting to know the truth. His enemies asked Him questions hoping to catch him in his words (Mark 12:13). And people the world over have been asking questions about Jesus ever since. God doesn’t mind questions at all. Truly, He invites us to ask: “Ask me and I will tell you remarkable secrets you do not know about things to come.” (Jeremiah 33:3-4 NLT). God actually enjoys making known what He knows to we who don’t: I am God, and there is none like me. I make known the end from the beginning, (Isaiah 46:9-10 NIV). In the end, only one question truly matters; and Jesus asks it: “Who do you say that I am?” (Mark 8:29). We each must answer it for ourselves, and how we answer makes an eternal difference: Whoever believes in him is not condemned, but whoever does not believe is condemned already, because he has not believed in the name of the only Son of God. (John 3:18 ESV). “Believe on the Lord Jesus Christ and you will be saved” (Acts 16:31 NKJV). “He who has ears, let him hear” (Matthew 13:9 NIV). Make it a point to tell others how Jesus touched and changed your life, so they can touch Him too. Despite all the evidence, Jesus’ own disciples had difficulty BELIEVING in His resurrection. On that Sunday morning, everything about Jesus – His mission in the world, His ministry and His message – was forever validated. Still they struggled to BELIEVE! Mary was blinded by grief. Peter and John still did not recognize that Scripture was fulfilled right before their eyes. And Thomas simply refused to believe it until He could see and touch Jesus for himself. Now, when it comes to FAITH, i.e. BELIEVING GOD, the Scripture is clear: Without faith, it is impossible to please God (Hebrews 11:6). Jesus had finished everything He came into the world to do. The proof was literally right in front of them, but they had to choose between doubting and believing. It is the same for every one of us. When the case has been presented and the evidence for Jesus laid before us, the time comes when we must choose to “stop doubting and believe.” The consequences of our choice are both life-changing and everlasting. Seeing IS NOT always believing! Jesus’ disciples saw many evidences to His resurrection within hours of the event; but they all struggled to believe. Mary Magdalene saw the stone rolled away, two angels and was the first to see the risen Jesus. Still, she did not recognize Him until He called her name (vv.1-2; 10-16). The other disciples heard the reports of Peter, John and Mary Magdalene, but they did not believe and rejoice until Jesus himself appeared to them that evening behind their locked doors (vv.19-20). Thomas heard all the others’ testimonies but vowed not to believe until He saw and touched Jesus himself. Jesus obliged him (vv.24-28). With so much EVIDENCE for believing in Jesus, His resurrection and everything about Him – why did His disciples struggle so with doubt? What causes doubt? The first doubt and innumerable doubts ever since are caused by SATAN (Genesis 3:4). He specializes in planting doubt into the human spirit. Jesus called him the father of lies (John 8:44). He even tempted Jesus to doubt himself and God the Father (Matthew 4:1-11). Our own EXPECTATIONS lead us to doubt. Mary expected to find things just as they were when she saw Jesus buried two days prior. Peter and John did not expect to find Jesus missing from the tomb. What they all found instead was just hard to believe. EMOTIONS can confuse and cause doubt. Mary’s grief and anxiety blinded her recognition of Jesus. DEMANDING MORE from God than He requires of us is doubting, not believing. Therefore, Thomas is commonly called Doubting Thomas. Jesus said that faith as small as a mustard seed can move a mountain (Matthew 17:20). It doesn’t take much to please God! Thomas demanded more evidence than was already given before he would believe Jesus was alive. Jesus described the generation of His day as “wicked” because they demanded a miraculous sign. He also said the only sign they would be given was “the sign of Jonah” – a reference to His resurrection (Luke 11:29). BIBLICAL IGNORANCE causes doubt. Though confirmation of multiple Old Testament prophets and Jesus’ own prophesies was starring them in the face, Peter and John still did not understand the meaning of all this (v.9). Paul writing to the Romans said, “So then faith comes by hearing, and hearing by the word of God.” (Rom 10:17 NKJV). Reading, hearing, learning the Scriptures not only increases our knowledge and understanding – it BUILDS OUR FAITH! The things we cannot see (the spiritual) are just as real and even more significant than what we can see (the physical) – 2 Corinthians 4:13-18. Doubting is more than not believing. Believing in Jesus is more than a statement. Believing in Jesus is “the substance of things hoped for and the evidence of things not seen” (Hebrews 11:1). Jesus’ himself is the SUBSTANCE (the content, solidity, body) of everything we hope for (believe in) as Christians; and His resurrection is the key EVIDENCE (proof, confirmation, substantiation) that what we believe in is true/valid – 1 Corinthians 15:17-23. Believing in Jesus is the only way to really live (John 14:6). We are what we believe (Proverbs 23:7). We walk (are guided in our everyday living) by our faith and not by our sight (Galatians 2:20). Jesus is the ONLY WAY to know God and live in His light (truth) not darkness (deception). There is a way that seems right to a man, but in the end it leads to death. (Proverbs 14:12 NIV). Believing in Jesus is knowing and applying His words (the Scriptures) to our lives: “Therefore everyone who hears these words of mine and puts them into practice is like a wise man who built his house on the rock. The rain came down, the streams rose, and the winds blew and beat against that house; yet it did not fall, because it had its foundation on the rock.” (Matt 7:24-25 NIV). Also see Luke 24:45-47. Believing in Jesus is LIVING in the BLESSINGS of God – Praise be to the God and Father of our Lord Jesus Christ, who has blessed us in the heavenly realms with every spiritual blessing in Christ. (Ephesians 1:3 NIV). LIFE, or the extinguishing of it, has been very much the talk of the nation these last few weeks since New York State law makers passed sweeping legislation that allows the wanton murder of children both within and outside the mother’s womb. Other states have since followed suit or are considering similar laws. America’s leadership among the nations in the slaughter of the most innocent and helpless just edged higher. Surely this is the most egregious violation of everything America was and is supposed to be. The very first document relative to our founding, the Declaration of Independence, declares that all persons have the “right to life”! And our Founding Fathers wisely recognized that it is the first responsibility of government to protect life, but the right itself is given not by government or anyone else, but by Almighty God! I submit to you that as Americans we are already engaged in a great new civil war. A war that will determine the future of our country, who and what we are and what we will be remembered for. This is a culture war; a struggle for the very soul of our people. There are multiple points of conflict between sides, but the ISSUE OF LIFE is the most contentious and unquestionably that one point on which there can be no quarter because apart from LIFE nothing else really matters. In just my lifetime, our society has devolved from a society that reveres life and recognizes the intrinsic value of every individual life to a culture that reverences nothing and insists that a person’s value is determined, not by their being, but by how their being affects others. This war is not fought nor can it ever be won with bombs and bullets. This is a battle for the heart and mind – what we believe and think as a people. The Bible says we are what we think (Proverbs 23:7). The Apostle Paul challenged New Testament believers to realize that ours is a spiritual warfare and the foremost weapons in our arsenal are TRUTH and RIGHTEOUSNESS (Ephesians 6:12-14) – what we BELIEVE and THINK! What we as a people believe and think about life will determine how we live our lives and how we view the lives of others. So, let us consider the DEFINITION OF LIFE and from there the MEANING OF ETERNAL LIFE! The Oxford English Dictionary definition of “life” is – “The condition that distinguishes animals and plants from inorganic matter, including the capacity for growth, reproduction, functional activity, and continual change preceding death.” This strictly physical and non-spiritual definition of life follows the school of thought espoused by progressives, socialists and atheists the world over, and we have been indoctrinating America’s youth into it for several generations. The idea that life exists apart from and is better off without God has been systematically drummed into the minds and hearts of our people via public education, the news and entertainment media, political leaders and even some in the Church for years – and now the armies advancing a culture of death and those defending a society that values life are called into action. Wells, Huxley and The Science of Life are only one example of numerous contributors dedicated to transforming America from a society that reverences life to a people that see it as not very special at all. The Bible gives a very different definition of life. Life is more than organic! Life is more than the capacity for growth, reproduction, functional activity, and continual change preceding death. Life is the capacity for KNOWING GOD! God made you both physical and SPIRITUAL! And the Lord God formed man of the dust of the ground and breathed into his nostrils the breath of life; and man became a living soul. (Genesis 2:7 KJV). It is the breath (life-giving Spirit) of God resident in you that elevates your life and the life of every human being above the purely organic. Your life BELONGS to God! I know, Lord, that our lives are not our own. We are not able to plan our own course. (Jeremiah 10:23 NLT) This really “ruffles the feathers” of those who reject the existence of God and our accountability to Him. Your life is PRECIOUS to God! His IMAGE resides in you (Genesis 9:6). An impoverished itinerant preacher and his wife had fourteen children and fifteen was on the way. Thank God they didn’t abort; He was sending us John Wesley – founder of the Methodist Church. A mother with TB is pregnant with child number five. Her first child is blind; the second died; the third is deaf; and the fourth also has TB. Thank God she didn’t abort – He was sending the world Ludwig van Beethoven. A 13-year-old black girl raped by a white man is now pregnant. They are so poor; the family often steals for food. Thank God she didn’t abort – He was sending us gospel artist Ethel Waters. A teenage girl is pregnant and the man she hopes to marry isn’t the father. Thank God she didn’t abort – God was sending us His Son, Jesus Christ. God alone knows how many blessings to humanity have been forever lost because their bearers were not deemed worthy to live. You are God’s MASTERPIECE made for His Glory! (Ephesians 2:10; 1:12). Literally, God broke the mold that made you. In the world of art there is only one Mona Liza. In all God’s universe, there is only one you. Countless priceless treasures have been destroyed in the name of personal choice! The preeminent prayer of Jesus Christ for you and me and the whole world is that we might know God and have ETERNAL LIFE! Eternal life is made possible through Jesus’ sacrificial death: “Father, the time has come. Glorify your Son, that your Son may glorify you. 2 For you granted him authority over all people that he might give eternal life to all those you have given him. Eternal life is had by RECEIVING and BELIEVING the WORD about Jesus Christ (vv. 6-8; Romans 1:16-17; 10:17). Eternal life is a SECURE life (vv. 9-12; Romans 8:35-39). Eternal life is a JOYFUL life (13-15; James 1:2-5). Eternal life is a SANCTIFIED (living for God not myself) life (vv. 16-19; 2 Corinthians 6:17-18). Eternal life is a UNITED (to God and with fellow believers) life (vv. 20-23; Ephesians 4:3-6). Eternal life is the GLORIFIED (God’s finished work) life – when we are present with and see Jesus as He is (v. 24; Romans 8:30; 1 John 3:2-3). ETERNAL LIFE is having an up close and PERSONAL RELATIONSHIP with GOD, and the only way to know God is through HIS SON, JESUS CHRIST! “Do not be afraid” occurs sixty-nine times in the New International Version of the Bible; “do not be discouraged six times; “let not your hearts be troubled” twice, and the word “peace” is there 250 times. Have any idea what God wants our attitude to be about circumstances in the world? The message of Jesus Christ, the gospel, is a message of courage, not fear. It is everything to celebrate and leaves no room for despair. The Son of God came down to earth to bring us up to heaven. The very God who sets the rules and judges the rule breakers, took that judgment upon Himself in our place. And this grace, this mercy, this salvation of God is for everyone who believes that Jesus is the Savior just as the angel announced (Luke 2:11). Fear is the opposite of faith. But faith in just anything is no antidote to fear. It is our faith in God that makes the difference. If our faith is in others no better than ourselves – what good is that? If our faith is in people we think are better than ourselves – they still come up short. If our faith is in fortune – stocks plunge. If our faith is in politics – administrations change. If our faith is in good health – don’t ever get sick. No, in all the world and in all the history of the world, there is only One who never has or ever will fail those who put their faith in Him – Jesus Christ. Jesus was so confident in His ability to take care of His followers that He equated Himself with God – “you believe in God, believe also in Me” (John 14:1 New King James Version). Starting on Christmas Eve, many German and British troops sang Christmas carols to each other across the lines, and at certain points the Allied soldiers even heard brass bands joining the Germans in their joyous singing. No one can say what tomorrow holds, but we know Who holds tomorrow. Faith in Him not only dispels fear, it wins the fray! Jesus is the one and only way to God and into His Heaven. He reveals to us the truth of who God is. That’s why He could say emphatically in 14:9 – Anyone who has seen me has seen the Father. And Jesus is himself the life God wants us all to have and the power to live it. Jesus and His disciples were still in the upper room where they had just observed the Passover meal together – the Jewish Seder. Jesus was preparing them for His imminent departure. He said in John 13:33, “My children, I will be with you only a little longer.” And, although the disciples didn’t realize it, within 24 hours Jesus would be lying dead in the tomb He borrowed from Joseph of Arimathea. His return is certain! He said – “I will come back”. His return is imminent! To His disciples’ earlier question “when” would it be, Jesus gave no date, no time and said only “keep watch, because you do not know on what day your Lord will come.” (Mt 24:32-42) That means it could happen any time! He is coming to take us to Heaven! “My Father’s house” is synonymous with “the house of the LORD” in Psalm 23:6 and is God’s dwelling place, i.e. Heaven (Matthew 6:9). Heaven is real! If it weren’t, Jesus would have said so. Heaven is BIG! The rooms are big as mansions and there are many of them – enough for everyone who wants to go there. John gives its physical dimensions in Revelation 21:16. Jesus is the ONLY WAY to the Father who is in Heaven! “I am the way. . .No one comes to the Father except through Me.” (v.6). If you want to go to Heaven, you got to go through Jesus! The POPULAR CULTURE of our day believes there is NO TRUTH and that whatever one person or one religion believes about God is as true as any other. But TRUTH EXISTS, and it is by definition EXCLUSIVE, CONSTANT and REAL. Let us consider just one truth of God revealed to us in Jesus that is exclusively Christian, constant in Scripture and made real to everyone who believes it, i.e. the LOVE of God expressed in the GRACE of God through Jesus Christ, the SON of God. Many people mistakenly think the God of the Bible and the god of the Quran (Islamic Scriptures) are the same God. Nothing could be further from the TRUTH! The Quran (Islamic Scriptures) states – “If ye love Allah, follow me; Allah will love and forgive you your sins.” (Qur’an 3:31) “Allah loves not transgressors” (2:190) “He loves not creatures ungrateful or wicked” (2:276) “Allah loves not those who do wrong” (3:57, 140) “Allah loves not the arrogant, the vainglorious” (4:36). Allah will show mercy to those who call upon him, forgive their sins and provide them guidance to follow “the straight path” so they may please him. Unlike Allah, GOD LOVES EVERYONE, even sinners! The Bible says, God showed his great love for us by sending Christ to die for us while we were still sinners. (Romans 5:8 NLT) To be sure, God DOES NOT ignore our sins. But, realizing our complete inability to follow “the straight path” (according to Islam) that pleases Him, God sent Jesus, His only Begotten Son, into the world to fulfill justice through His death and to make us righteous through His life: For by grace you have been saved through faith. And this is not your own doing; it is the gift of God, not a result of works, so that no one may boast. For we are his workmanship, created in Christ Jesus for good works, which God prepared beforehand, that we should walk in them. (Ephesians 2:8-10 English Standard Version) The word for the love of God expressed to us this way in Jesus is GRACE! THE TRUTH IS, God by any other name is NOT THE SAME! Acts 4:12 declares, “Salvation is found in no one else, for there is no other name under heaven given to men by which we must be saved.” (NIV) Allah requires we please him to be saved. God saves us so we can please Him. That is LOVE! That is GRACE! And, that is the God I serve! Jesus is much more than our example of how God wants us to live. Jesus IS THE LIFE God wants you to have and the power to live it! Living to please the Lord – So we make it our goal to please him, (v.9a). If you’re alive, then you’re on your way somewhere. Life, this life, here and now, your life is not an end in itself. It is a journey on your way to eternity, and at the end of your journey you will spend eternity either with God or away from God. Jesus Christ, the Son of God, came into the world, this world, this life to show us the way to God and into His Heaven. He came to reveal who God is to us, that He loves us and wants us to come and live with Him forever. And, Jesus came so that we might please God in our lives both now and forever. No matter where you look, you will never find in anyone else or in any other faith/religion One who is the Way to God, the Truth of God and the Life of God. All you must do is BELIEVE! This is arguably one of the most incredible statements Jesus ever made about Himself and it ought to have ended any credible claim He had to be Israel’s Messiah. Instead, by raising Lazarus from the dead, He proved that not only is He the Christ but the Son of God as well. Inspirational literature intended to encourage belief in Jesus Christ. Jesus proved that He could do what only God can do – GIVE LIFE! Genesis 2:7 says God breathed into man the breath of life: and man became a LIVING SOUL. Job 12:10 says the soul of every living thing and the breath of man are in God’s hand. Many make the claim or have the very mistaken idea that Jesus never claimed equality with God. They say the idea that Jesus was/is God is one that evolved in the growing first century Church. But, if you believe John’s gospel is a historical narrative of real events; and if you believe in miracles; then the EVIDENCE CONFIRMS Martha’s confession – Jesus is the SON OF GOD (v.27). A confession that Jesus not only accepted but later affirmed: “Did I not tell you that if you believed, you would see the glory of God?” (v.40 NIV). Jesus Christ is the GLORY (the very essence and person) OF GOD in the flesh: So, the Word became human and made his home among us. He was full of unfailing love and faithfulness. And we have seen his GLORY, the glory of the Father’s one and only Son. (1:14 NLT). Jesus is the resurrection and the life. Whenever Jesus prefaced these names/titles with “I am”, He was identifying Himself as God. You’ll remember that “I Am” is how the LORD identified Himself to Moses in Exodus 3:14 when He commissioned him to bring His people, Israel, out of Egypt. “I Am” is equivalent to Yahweh/Jehovah transliterated in our English Bibles as “LORD” and the name by which God revealed Himself to His people (Ex 3:15). Jesus’ referencing Himself as “I am” was understood by the Jews as calling Himself God, so they threatened to kill Him (8:58). When Jesus said, “I am the resurrection and the life,” He was claiming to be the source of both. There is no resurrection apart from Christ, and there is no eternal life apart from Christ. Beyond that, Jesus was also making a statement concerning His divine nature. He does more than give life; He is life, and therefore death has no ultimate power over Him. Jesus confers this spiritual life on those who believe in Him, so that they share His triumph over death (1 John 5:11-12). Believers in Jesus Christ will experience resurrection because, having the life Jesus gives, it is impossible for death to defeat them (1 Corinthians 15:53-57). He proved His power as the Son of God to raise the dead to life. Lazarus was the third person Jesus resurrected. He had been dead four days and already begun to decay. Jesus resurrected Himself by His own power on the third day following His crucifixion, and He will never die again. He said those who believe in Him will live, even though he dies (v.25) – that is the RESURRECTION. He said the dead (multiple) would hear His voice (just like Lazarus), come to life and live ETERNALLY [John 5:23]. And, if there were no actual SUBSTANCE of things HOPED for, or EVIDENCE of things NOT SEEN, they might be right. But Jesus is, by virtue of His RESURRECTION power and by the LIFE He gives right now to all who believe in Him, the substance of things hoped for and the evidence of things not seen (Hebrews 11:1). JESUS CHRIST is both our HOPE (RESURRECTION) and the SUBSTANCE (LIFE) of our hope! The testimony is this: God has given us eternal life, and this life has its source in his Son. Whoever has the Son has this life; whoever does not have the Son of God does not have life. (1 John 5:11-12 Good News Translation) Notice it is present tense – has this life. but it is Christ who lives in me. This life that I live now, I live by faith in the Son of God, who loved me and gave his life for me. (Ga 2:20-21 Good News Translation) The life we LIVE NOW is by faith in Jesus, the Son of God. It is described in part by His other “I am” statements: “bread of life” – sustenance; “gate” – the way in, community; “the good shepherd” – sustenance, security, guidance; “the way, the truth and the life” – direction, understanding, purpose; “the vine” – vitality, productivity, connection. Lazarus, already decaying after four days, was raised completely whole. It is the same way with the resurrection of the dead. Our earthly bodies are planted in the ground when we die, but they will be raised to live forever. 43 Our bodies are buried in brokenness, but they will be raised in glory. They are buried in weakness, but they will be raised in strength. 44 They are buried as natural human bodies, but they will be raised as spiritual bodies. For just as there are natural bodies, there are also spiritual bodies. Other religions can talk about life after death, but only Jesus Christ gives you the substance (ETERNAL LIFE) of what you hope for (RESURRECTION) right now! “Do you believe this?” (v.26). WOLEC Statement of Faith, Article 12.